Starring Hailee Steinfeld, John Cena, Jorge Lendeborg Jr., Pamela Adlon, John Ortiz, Jason Drucker, Stephen Schneider, Len Cariou, Ricardo Hoyos, Glynn Turman, Kollin Holtz, Gracie Dzienny, Fred Dryer, Isabelle Ellingson, Mika Kubo, Megyn Price and the voices of Angela Bassett, Justin Theroux, Peter Cullen and Dylan O’Brien. Distributed by Paramount Pictures. 103 minutes. Not Rated. It’s hard to believe that this is the sixth film about Transformers – those ridiculous toys which turn cars and planes into very odd-looking battling robots – in just over a decade. Now I’ll be the first to admit that I am too old to have really appreciated the original Transformers toy craze in the 80s and 90s, and I never watched the animated series or the old-school animated movie. I feel no nostalgia for the toys, and I felt little or no connection to the insanely long, violent and incoherent Michael Bay films, which seems to be the action director’s only line of work for the last decade or so. I did kind of like the first hour of the first Transformers movie, before it became a ridiculous slug-fest between robots, a dizzying whirl of chaos and explosions. However, one of the fan favorites in the first Transformers, one who was quickly (and a bit mawkishly) killed off in the series, was a yellow and black Camaro called Bumblebee. 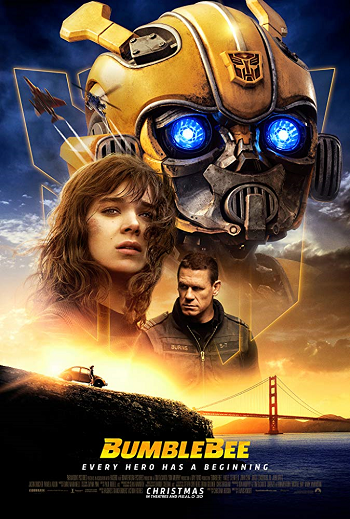 What is noteworthy about Bumblebee is the fact that for the first time since the new series premiered in 2007, Bay has allowed someone else to direct one of the films – Travis Knight, the animator behind Kubo and the Two Strings, The Boxtrolls, ParaNorman and Coraline. So just the fact that someone other than Michael Bay is directing this series prequel makes things better. Add to that the fact that Bumblebee also has no Shia LeBeouf or Mark Wahlberg mucking things up. It can only be an improvement, right? Therefore, Bumblebee right away sprints to the top of the quality list of the Transformer films, alone with the first film in having any enjoyable parts at all. Well, at least the first hour of the first Transformers film had some enjoyable parts. Of course, saying that Bumblebee is a good Transformers movie does not necessarily mean it is a very good movie in general. And it is not. Being more bearable that Transformers: Revenge of the Fallen is hardly an impressive accomplishment. However, Knight’s direction – and the screenplay that was actually written by a woman, Christina Hodson – does actually make the film less aggressively knuckleheaded than the previous Bay films. It allows for some actual human emotion, some character development, and even for some low-key comedy. Yeah, this one also has too much ridiculous and insanely violent fighting between robots. You know… machines. Which can’t feel pain. Why exactly are we supposed to be invested in this, again? In fact, John Cena’s military man character at one point says to Steinfeld, “It’s just a robot.” I know that was supposed to be a boo-hiss bad-guy moment, but I’m not going to lie, I had to agree with him. Still, this is the first Transformers product (and it really is that, product) that had a bit of humanity to it. Oddly enough, Steinfeld’s character often feels like a mirror image of the role she played in her earlier indie film The Edge of Seventeen. Like that girl, Charlie is a moody, depressive, outcast who is trying to get over the fairly-recent heart attack death of her father and doesn’t realize that the nerdy guy hanging around has totally got a crush on her. It’s pretty much the same character, just without the clever dialogue from the other film, but with added robot mayhem. Steinfeld and Cena – who continues to be a much more quirky and subtle actor than his pro-wrestler’s physique would lead you to believe – make Bumblebee more fun that it probably should be. And, okay, if you do want to rate the silly looking Transformers, Bumblebee as a character is certainly more likable than most of them. He does have a shy sweetness and is able to do slapstick comedy like a pro. If I’m going to have a rooting interest in a weird-looking robot with tires and doors and other stuff pointing out in odd angles, it would be him. So, if you must see a Transformers film, this would probably be the one to choose. Copyright ©2019 PopEntertainment.com. All rights reserved. Posted: April 2, 2019. Tags: Angela Bassett, Autobots, Bumblebee, Christina Hodson, Coraline, Decepticons, dylan o'brien, Fred Dryer, Glynn Turman, Gracie Dzienny, Hailee Steinfeld, Isabelle Ellingson, Jason Drucker, Jay S. Jacobs, John Cena, John Ortiz, Jorge Lendeborg Jr., Justin Theroux, Kollin Holtz, Kubo and the Two Strings, Len Cariou, Mark Wahlberg, Megyn Price, michael bay, Mika Kubo, movie review, Optimus Prime, Pamela Adlon, ParaNorman, Peter Cullen, PopEntertainment.com, Ricardo Hoyos, Shia LeBeouf, Stephen Schneider, The Boxtrolls, Transformers, Transformers: Revenge of the Fallen, Travis Knight. Bookmark the permalink.